KRYPTON Review: Who Speaks For Rao? I thought The Voice Of Rao dude was part of Brainiac’s plan, but I was wrong. But by episode’s end, I’m right. The episode opens by showing us that The Voice Of Rao is a regular guy, who’s kind of a manipulator. He has Lyta Zod arrested for treason, as a scapegoat for the incident with the Rankless last week. But she’s totally being framed. And the punishment for treason is death. Meanwhile, Seg-el’s been kidnapped by a ruthless faction of Black Zero that knows about Brainiac. We don’t know much about them yet, but they’re just pretending to go along with Black Zero’s agenda to access their resources. It’s complicated, right? But that’s what makes it interesting. 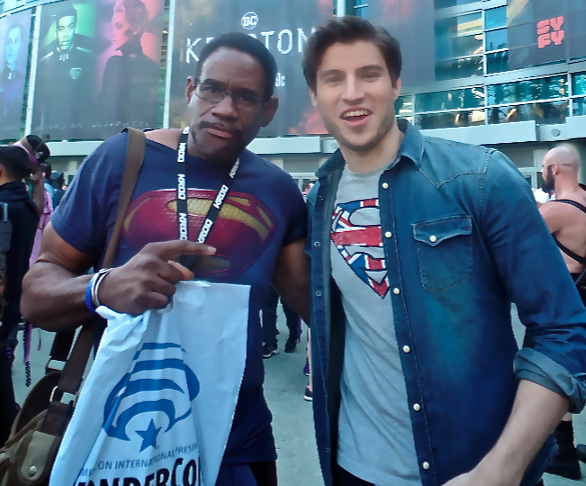 I am enjoying Krypton, and the world that show is creating. And I think it works best when they focus on what’s happening in the here and now, instead of dwelling on the whole ‘Let’s-save-Superman-through-time-travel’ subplot that I don’t think the series needs. We don’t see the slowly disintegrating cape this entire episode, and that’s a good think. But what we do see is that Brainiac is one step ahead of everyone, as he should be. After all, he’s so smart the word ‘Brain’ is part of his name. Anyway, when the Mom was infected with the Brainiac virus last week, she gave her daughter an action figure, knowing that the girl would give it to Rao, as tribute. Then the action figure infects The Voice Of Rao, turning him into a minion of Brainiac. That green dude is clever. So, who speaks for Rao? Brainiac does! We don’t see much of Adam Strange this episode. And we still don’t know if the Fortress was able to repair his Zeta-beam device. Which he needs to get back to Earth, and his proper timeline. But quick question; how is Adam getting from Kandor to the Fortress? The Fortress is supposedly out in the frozen badlands, not around the corner, and you need a flyer to get there. And last time I checked, neither Adam nor Seg have a flyer. I guess they could be continually borrowing Kem’s flyer. But then how do they get to the Fortress separately? Which seems to happen quite frequently. But to heck with the details; the show has a great look, interesting characters, and knock on wood, it’s telling an interesting story. Plus! Seg-el is in love with Lyta, Nyssa is pretending to be in love with Seg-el, and Seg-el might be falling for Nyssa who is the mother of his pod-baby, while Dev-em is in love with Lyta, and Lyta kind of likes Dev-em who is her future husband, and Dev-em hates Seg-el. Kandor is like a small town. Everyone is involved with everyone else. So it’s part science fiction, part fantasy, and part nighttime soap, who can ask for anything more? And I don’t think Lyta will be executed, but her freedom may come at a price for house Zod. Nyssa and her dad are planning a coup. But they need the army’s help to overthrow The Voice Of Rao. So to save Lyta, her mother Jayna is being forced into an allegiance with Nyssa and house Vex. And just for the record, Daron-Vex doesn’t have what it takes to stage a coup, but Nyssa is hard as nails, stepping up to take charge. LAST WORDS: During a pretty violent interrogation; the new bad guy puts a bug, the size on a jumbo shrimp, up Seg-el’s nose and it crawls out his ear. Then the guy proclaims that it didn’t do any permanent damage. And while that doesn’t sound possible, I guess we’ll have to take his word for that. Then Seg-el escapes and ends up in the frigid badlands, with no protective gear. AND he’s bleeding, apparently hurt during the escape attempt. So how is he supposed to survive? Stay tuned to find out. *Note: If Seg-el ends up just walking to The Fortress I will be very upset, because given the info we’ve gotten so far about The Fortress’s location, that wouldn’t make any sense at all.